Read on your PC, Mac, smart phone, tablet or Kindle device RIGHT NOW. Affirmations don’t work for most people. Why? Because most people think that it’s the words that make Affirmations work. But it’s not. It’s what the Affirmation does inside you and how it affects your subconscious mind in a way that unleashes the creative power in you. People who rave about Affirmations know that but most of them can’t really explain how to make them work, what exact steps to take and how to guarantee Affirmations do what you want them to do every time like clockwork. 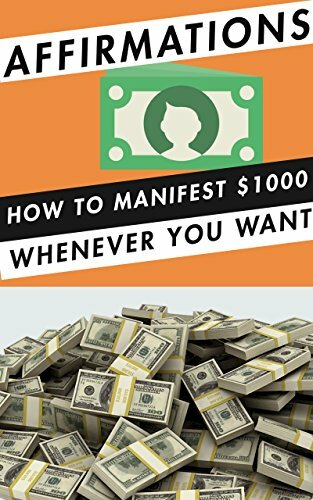 So the promise of this book is to show you a way to not only manifest 1000$ whenever you want but to improve every area of your life like relationships and health goals by using the incredible power of Affirmations. If you finally want to break through this inner mess and achieve your goals like clockwork every time (and how to make sure you are on the right path with your Affirmations. Don’t fall into the trap of taking someone else’s canned Affirmations and thinking that they will work for you. They can work in rare cases. But I want you to MAKE SURE they do work every time. Everyone is different with a different history and different internal processes. So it’s important to make sure that the Affirmation fits the person who uses it optimally to guarantee success. How often should you repeat your Affirmations? Don’t lose any more time with banging your head against brick walls by trying to achieve goals in a way that obviously doesn’t work for you. Don’t let the pattern of setting goals and failing over and over repeat itself. There is an easier and more efficient way to use your will-power for achieving goals. And you can do it by following this insanely practical, step by step guide! Scroll Up & Download Your Copy Now!